This is the introduction to a set of articles designed to give you some idea of what to consider when faced with flop decisions in hold 'em. 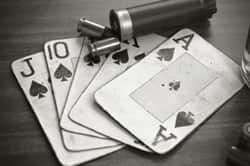 The purpose of this introduction is in part to act as a reference for some of the concepts I make use of in the series, as well as act as a form of disclaimer; No article or book on poker is going to be complete and full-covering, and for stringency it's important to declare where the limits are drawn. To help us find the right action to take, I'm going to mostly be using the Fundamental Theorem of Poker. If you're not familiar with it, it - for the purpose of this series, at least - basically means this: Whoever makes the fewest and least costly mistakes will be the one who profits. It applies specifically to heads-up situations, which fits this series perfectly. Heads-up limit hold 'em is a battle of mistakes. By "mistake" I mean putting in money when you shouldn't, and failing to put in money when you should. If you can get your opponent to put in money when he shouldn't, you'll profit. If you can avoid putting in money when you shouldn't, he won't. When poker comes down to a battle of mistakes, hand reading is vitally important. Since we'll only usually have one street worth of information (preflop), and on top of this my examples are from online poker rooms, we'll have to settle for a mathematical approach based on percentages given by PokerTracker stats (see below). If we don't have even that much ("playing against an unknown") we have to base our actions on what the average player is like and act accordingly. The heads-up situations are presuming that only two players see a flop, not that there are only two players at the table. This is a very important distinction because of the effects it has on the possible hand ranges. See below regarding blind steals. Unless otherwise stated, I presume that the opponent in the examples I show is a decent - not expert, not awful - player. The kind of mistakes that such a player will make include being a little too loose preflop, a little too loose on the flop, bluff too often and slowplay too often. Blind steals are not included. The goal of the articles is to illustrate aspects to take into consideration when two real hands are up against each other on the flop. In a steal situation, one or both players will often have nothing, and even weak nothings. Knowing how to play in these situations is important, but is not a part of the scope of this series. See this Blind Stealing article for an introduction to blind steals. Another fundamental concept. See the Poker: Equity article for an introduction to equity. In limit hold 'em, especially in heads-up pots, the preflop raiser will virtually always make a continuation bet. Therefore, many players like to check-raise (or just smooth-call) when they flop something good, and, for reasons I will not speculate about, when a player instead decides to bet into the preflop raiser, this is often called a "donkbet" or "donking the flop." As a sidenote, the term works for the turn and river as well - it basically means betting into whoever has the initiative. This, of course, can only be done by the player out of position. There are two different free cards plays, both requiring position: Opting not to bet in position on the flop to see a cheap turn, and betting the flop, leaving open the option to check behind on the turn to see the river. Some reads are presented as pokertracker stats, e.g. "35/12/1.5" and these numbers mean, respectively: VP/PFR/AF. VP: Volountarily put money in pot. A percentage indication of how loose the player is preflop. This value does not automatically equal "number of flops seen" since a player checking the BB will not get "points" on this scale. PFR: Preflop raise. Percentage of hands this player has raised with preflop. AF: (Postflop) Aggression Factor. Sum of bets and raises, divided by number of calls, i.e. a ratio. This ratio, as the name implies, says something about how passive or aggressive a player is. In order to properly understand the numbers, it helps to have some idea of what "normal" play means. At 6-max tables, good players usually range from 20/14/2.5 to 30/20/1.8. Note that VP and PFR usually go hand in hand as they go up, whereas the postflop aggression factor usually goes down with an increased VP. The reason for AF going down is simply that good players will not put in as much money when they're behind as when they're ahead, and a looser player will be behind after the flop more often than a tighter player. A semi-loose player usually ranges VP 30% - 40%. Loose players around 40%-50%, and then there's the "fun" players who play 50-60% of their hands. Once in a blue moon, you find a player who will literally play every hand, but they're so rare that trying dissect hands that contain such players is not going to be worthwhile*. There are, of course, other ways a person can be a winning player without being specifically within the range of stats I list above. But they're the exception, not the norm - and as a general rule of thumb, if someone deviates by a fair margin from these numbers, you can be pretty sure that they're making mistakes somewhere, and we will discuss how to exploit those mistakes on the flop. Having said that, stats can be argued indefinitely, but this is not the focus of this series. One other stat that I will sometimes look at is WTSD which stands for "Went To Showdown" and is a percentage showing how often a certain player, once she sees a flop, actually gets to showdown. This is sort of the postflop equivalence of VP; how loose a player is once they decide to continue preflop. As with AF, this value has different meanings depending on VP. Someone who sees a LOT of flops, would do well not to go to showdown very often. Someone who - and I take the extreme example - folds everything but AA and KK would do well to go to showdown virtually always. A certain value of WTSD isn't "good" or "bad" on its own, it's a product of how loosely you play preflop. * Ironically, however, the very first hand analyzed is in position against a 76/16/1.1 player.